Unfortunately, Freddie is not the only one in this country with an odd shower which is funky with a capital “F!” It’s simple to identify and say – Man, that is an odd space – it’s much more challenging to get a game-plan to conquer this crazy shower and transform your bathroom into a functional, stylish and maintenance free place. Even after Freddie sent me pictures and a drawing it took 45 minutes on the phone to BEGIN to get a plan together to get this weirdness under control. My goal in this article is to give you practical tips to get your arms around this project – whether your man (or woman) enough to tackle it as a DIY’er – or plan to bring a contractor in (note – if you look for a professional contractor you’ll need to find one who likes a challenge, knows what they’re doing, won’t demand your first- born child or force you to take on a second job to pay for this remodel to ‘get ‘er done). Let’s look at these 5 ½ tips (the ½ tip is the cherry on the top) and stop putting up with the nastiness that is your strange shower today! No, I’m not suggesting a trip to the psychiatrist and plopping on the comfy black leather couch and opening those wounds on how this shower would be easier to fix if your parents had treated you better! 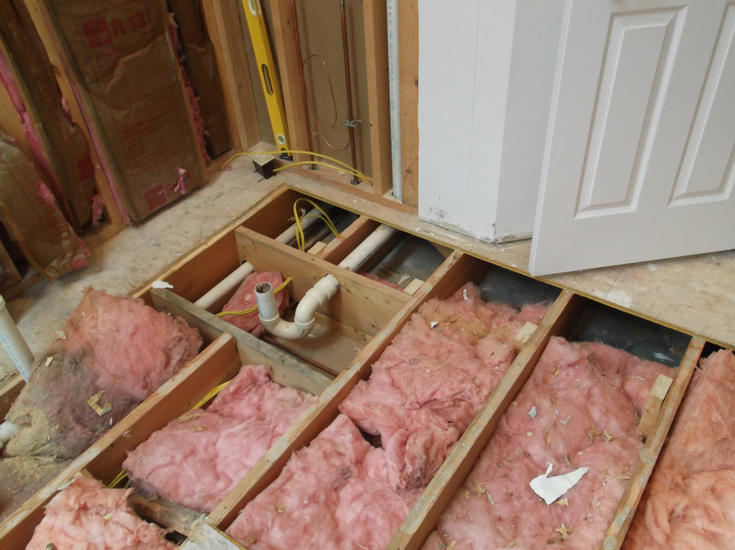 I’m saying you need to seek advice from people who’ve down this rabbit hole before – the grizzled remodeling contractor, craftsman, knowledgeable blogger or super-handy brother in law who will provide you with input and genuine advice on how to tackle this monster. 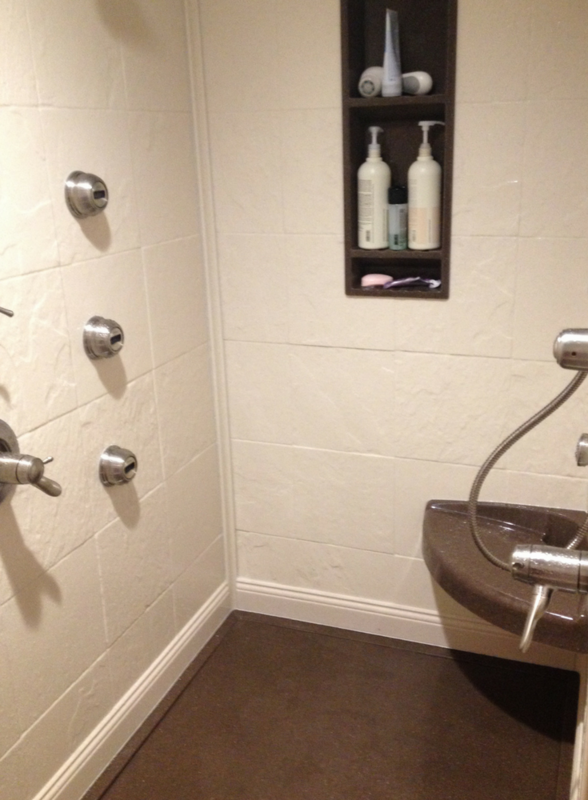 (1) Go on the Internet and search for articles written about odd shaped showers. There you’ll find contractors, bloggers and even a few homeowners who think and write about this stuff. Consider calling these people to get help! (2) Post your weirdness (no I’m not talking about your personal weirdness) on Houzz. On this site, you’ll get input – for free – from contractors, home owners and interior designers for your shower dilemma. (3) Have the top contractors in your town to your home for a visit. Usually the top-rated contractors in your town (you can find them through sites like Angie’s list) have the best people (although they generally charge more and pay their talented staff higher wages) who excel where the cheap “Chuck-in-the-truck-who-does-jobs-on-the-side” guys won’t have a clue how to remodel your weird shower (and for this type of shower the cheap guys will likely never contact you back with the estimate). 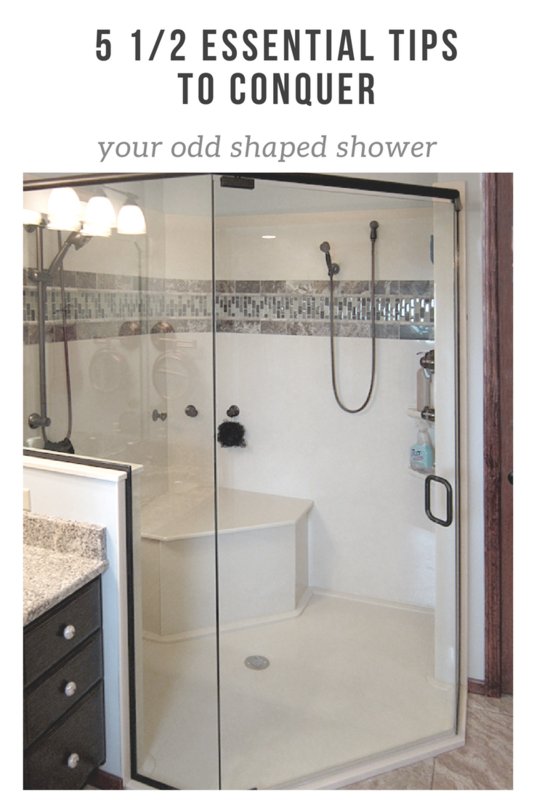 Odd shaped shower tip #2 – Consider blowing it up! Sorry to break this to you, but sometimes the best strategy with an odd-shaped shower can be to blow it up and gut the entire bathroom. If you’re trying to work within an existing space which was designed wrong in the first place the best idea may be to bite the bullet and reconfigure with a full bathroom remodel (don’t take this path lightly – but remember to consider it as an option). Assuming this strategy doesn’t make sense, proceed to tips 3 through 5. Assuming tip #2 isn’t right (or practical) for you you’ve got to the start from the bottom (the shower pan) and then work your way up. Think of the pan as the “foundation” of your shower. If the foundation of your shower has a problem you’re in serious trouble. 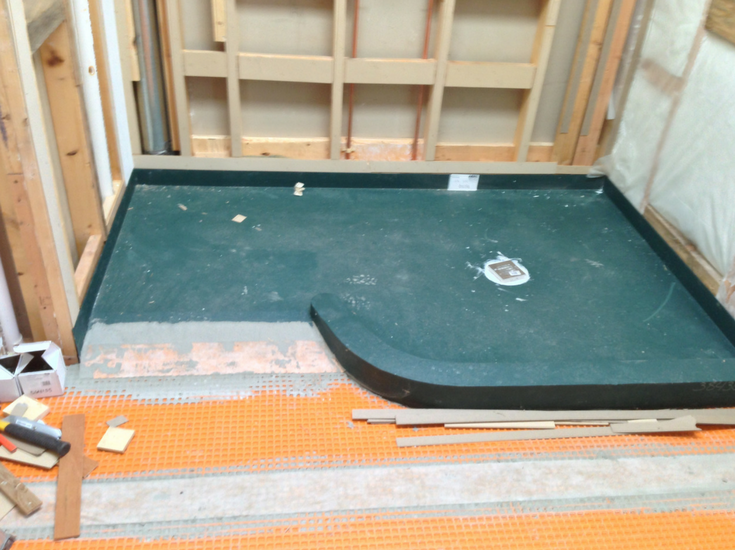 (Option 1) A site built waterproof ready for tile shower pan – Two popular systems include those made by Wedi and Schluter. These manufacturers provide waterproof components which are site assembled and use a modified thin set and tile to cover the substructure. (Option 2) A prebuilt custom waterproof ready for tile base which is ready for installation – With this system you don’t have to worry about putting components together. You take the custom made ready for tile pan, thin set it to floor and tile over the top– it’s time effective and takes the guess-work out. The disadvantage is you have to get all the specs figured out before you order – where in option 1 above you can figure out the specifics on the fly. 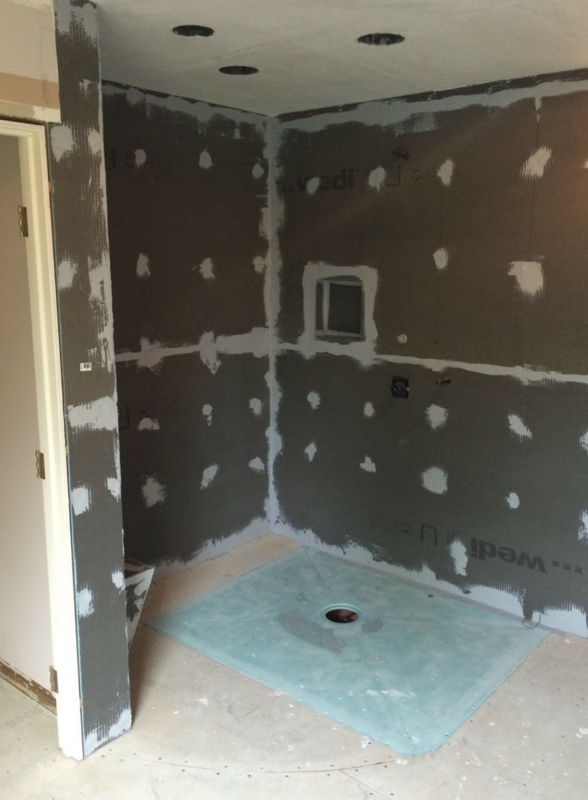 Check out below an in process and completed photo of a ready for tile shower pan project. (Option 3) A solid surface pan – If you’re sick and tired (or not physically up to the task) of cleaning grout joints a solid surface shower pan is an excellent way to go. It is made to your specs and available in 51 different colors. (Option 4) A one level wet room – With this shower system you eliminate the curb and combine your bathroom and shower into one continuous space. This can be best if you have a family member with mobility challenges or just love a sleek, minimalist look. 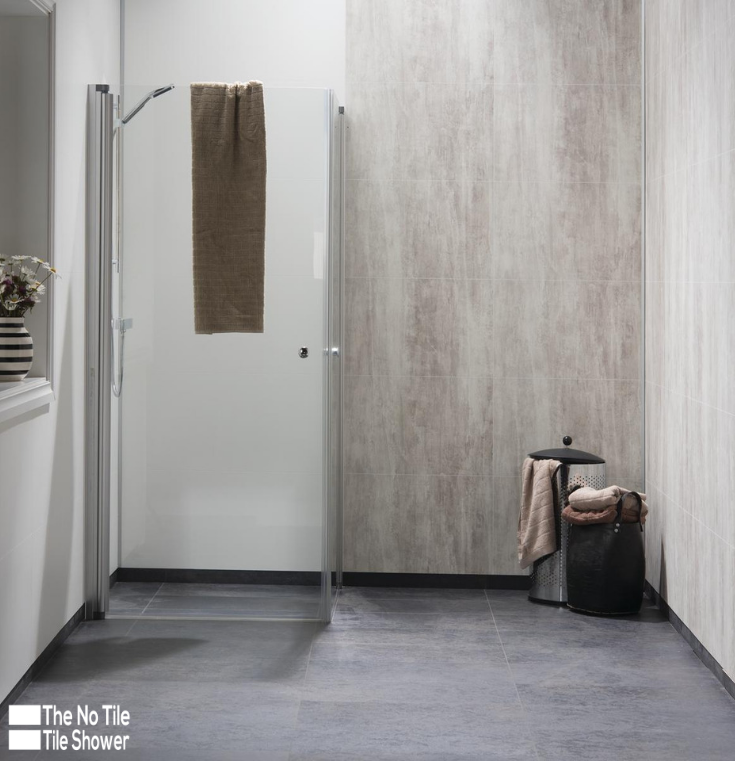 Alternative 1 – Cut to size modernized tile walls – If you decide to replace tile with tile make sure to upgrade your look (tile trends today are sleek and contemporary) and downgrade your maintenance. 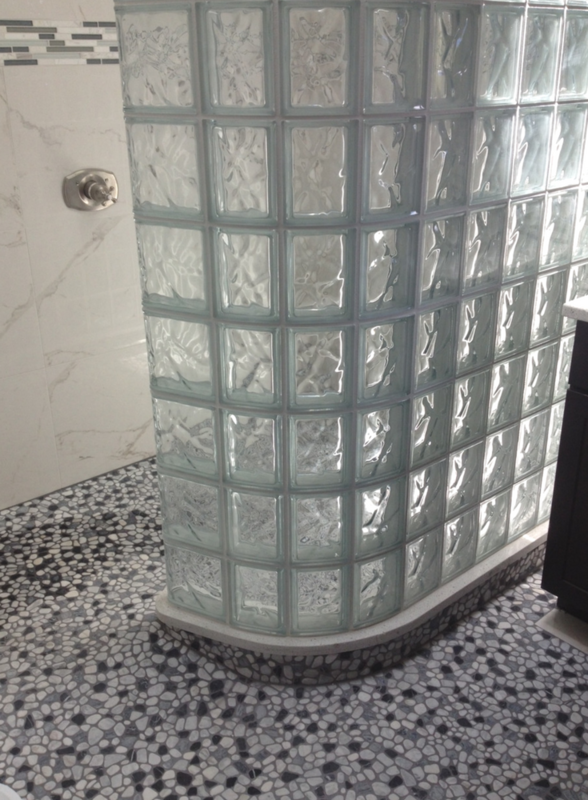 Get rid of small 4” x 4” or mosaic l tiles and replace them with larger 12 x 24 tiles or glass tiles for style. If you do decide to go with the “cut to size” tile option use a better grout (urethane grout is one option) and pay a few extra bucks for waterproof wall boards behind them. As my Dad used to say, “Don’t be penny-wise and pound foolish.” Do the little things right (choosing a top-quality grout and wall board) so you won’t be spending big bucks later fixing what you completed now. Alternative 2 – Made to order grout free wall panels (making it simple on you)– Are you like me and hate to “work” when you’re ordering a meal at a restaurant (yes – if I order crab I want it out of the shell!). If this is your “M.O.” you’ll want to make your life easy and reduce your shower wall installation time. The way to accomplish this is with pre-cut shower panels. Use laminated shower panels or sleek high gloss units and get precut sizes to cut your hassle and get finished quicker. Alternative 3 – Standard sized wall panels you cut – Sometimes it’s impossible to know exactly the size you need until you’re knee deep in the project. This sometimes occurs where your walls are so out of square you’re scared of getting anything precut. A DIY friendly PVC composite wall system is one such system to consider. 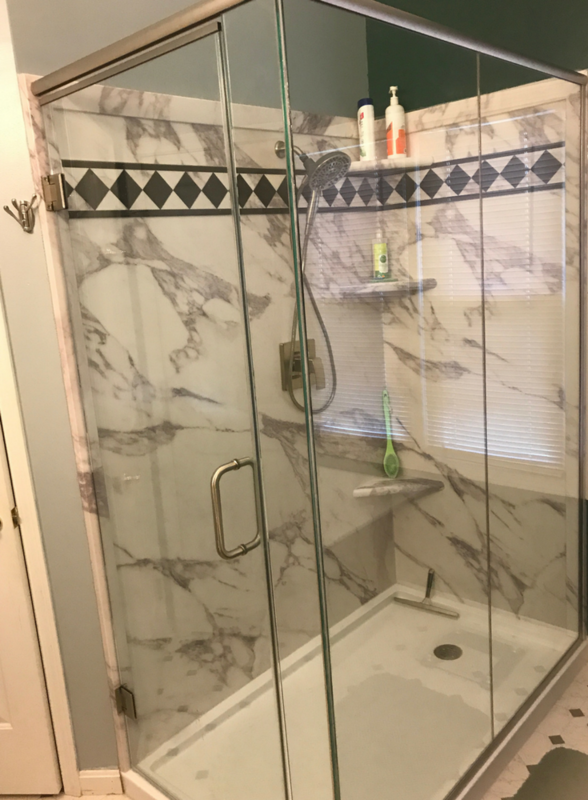 Whether you want to get rid of the “closed-in” feeling of a framed tile shower with a small door opening or create a door-less walk in to eliminate the hassle of a shower door, the entryway of your shower is critical. When you’re working with an odd shaped shower you’re not going to find glass enclosure answers on the shelf at your local big box store. 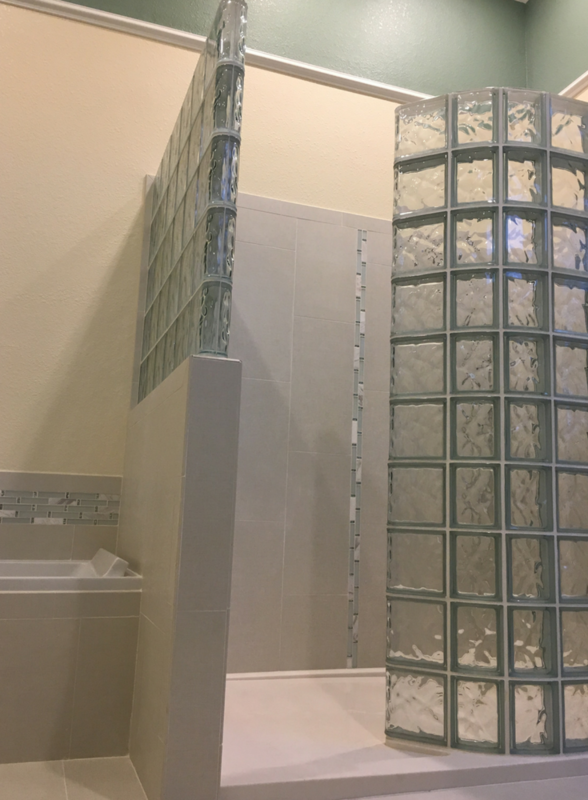 Custom showers require custom glass solutions. Here’s 2 ways to make sure your glass and shower base work together. 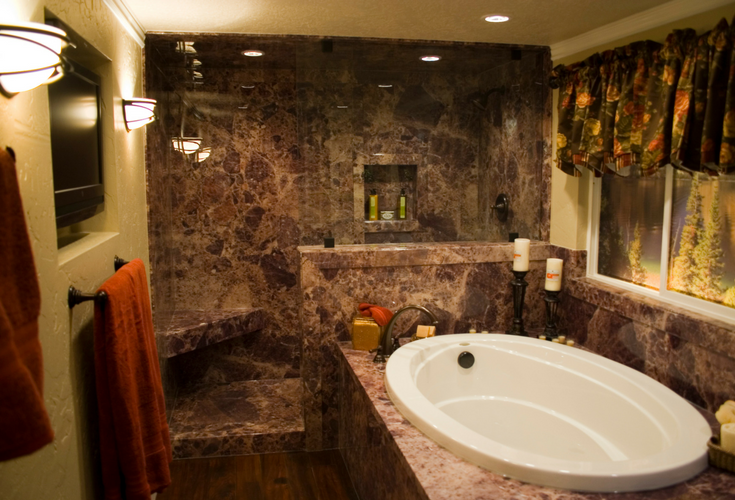 1) Wait until the shower is completely done and have a custom glass company visit your home. The glass company will measure for a frameless or semi-frameless shower system and custom manufacture the glass to make it fit. With this option, you’ll have peace of mind knowing it will be measured to size and professionally installed (assuming the company you choose ends up being professional). It will be a more expensive – but sometimes it’s easier to let someone else figure things out. 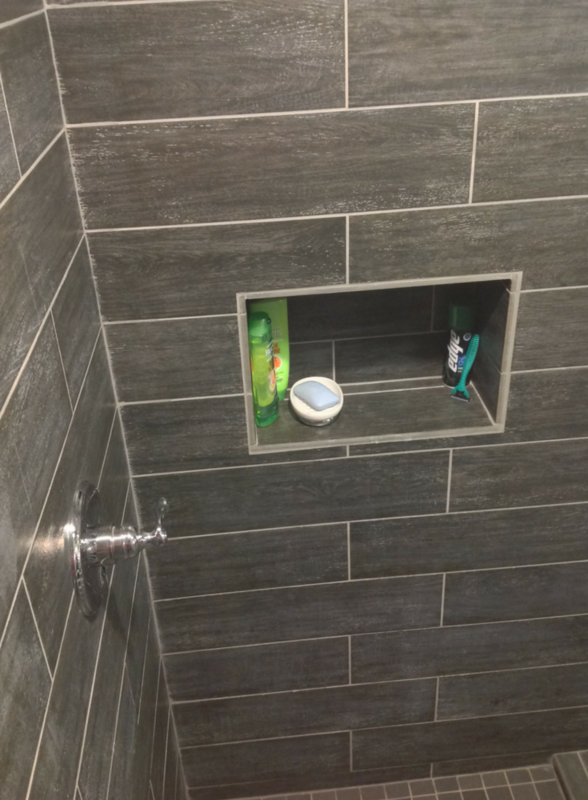 2) Buy a shower pan and glass enclosure system together as a kit – With this option you’ll be able to DIY the project – even though your dimensions are custom – since the glass enclosure will be built and designed to fit the shower pan dimensions (the glass and base are designed to work together). This option will save you installation costs and the worry of having the two components (the pan and the glass) work together. Yes – I’m Italian so that means I have cannoli’s on the mind ALL THE TIME! But the cherry on the top of any shower (the “dessert” of the shower if I can call it that) are the accessories which make it “live” like a beautiful spa. When designing your shower look at fun and functional ways to add a corner bench seat, recessed niches and lighting. A safe and luxurious shower is one which includes everything- down to the smallest details. Yes, odd shaped showers can be a major pain –especially if you’re stubborn and try to “go it alone!” Get help from professionals up front. Develop a plan – whether it’s to work inside your existing space or to blow up the entire bathroom (not literally, although you may be considering it) for a complete remodel. Start at the bottom (just like you did with your first job) and work on the shower pan. Next move up and figure out the walls and your glass enclosure. Lastly, don’t forget those “cherry-on-the-top” accessories – they can turn an ordinary bathroom into an extra-ordinary experience. How can I (or a member of my team) help you? It’s fun (OK – if I’m being real it’s a lot of work) to write articles about odd shaped showers and bathroom remodeling – but it’s a lot more fun to actually help you through your crazy spaces. That is what our team does best (maybe it’s because we’re a bit crazy ourselves – just saying). If you’re remodeling anywhere in the country please call us at 877-688-5888 or send pictures and a rough sketch of your wacky bathroom and we’ll gladly help you. If you’re into the Cleveland area stop in our Cleveland Design and Remodeling showroom or call at 216-658-1270. In Columbus call 614-252-3242 and we’ll get you on the right path. If you’re in the building business, click here if you’d like to learn how to become a shower wall panel dealer or call and ask for Mike at 877-668-5888.